Flood Warning System for Chehalis River Basin Flood Authority (WA) | WEST Consultants, Inc. 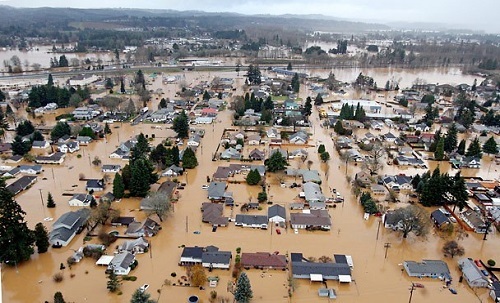 Following a devastating flood in December 2007, Chehalis River Basin stakeholders intensified efforts to mitigate flood risk in one of the most flood-impacted watersheds in the State of Washington by forming the Chehalis River Basin Flood Authority. The Authority quickly determined that improvements were needed to the existing flood forecast and warning system for the Chehalis River Basin. The region required a more reliable information network than what had become a “word of mouth” warning process. On behalf of the Flood Authority, WEST Consultants worked with community groups, Indian tribes, and local governments within the basin to assess their current flood preparedness practices and needs. In addition, flood forecasting and related programs of the National Weather Service (NWS), the U.S. Geological Survey (USGS), the U.S. Department of Agriculture Natural Resources Conservation Service (NRCS), and the Washington State Departments of Ecology and Transportation were reviewed. The findings led to a plan for improving the identification of flood threats, agency coordination, and communication with the public. The plan included an Internet-based data collection, visualization, and dissemination tool plus additional rainfall, temperature and river monitoring stations to fill gaps in existing observation networks in the Chehalis River Basin. Engineers and scientists at WEST developed a comprehensive Chehalis basin-wide flood warning system that brings all real-time flood warning data collected by several different agencies to a common website. River Measurement, a division of WEST, was contracted to identify locations for new data collection sites and installed 10 real-time monitoring stations within the Chehalis River Basin. All of the stations measure precipitation and air temperature, and two of them measure river water levels. The stations transmit data to the GOES-West environmental satellite to obtain real-time data. This additional information is improving river forecasts at existing National Weather Service forecast points in the Chehalis watershed. WEST continues to provide operation and maintenance of 10 monitoring stations.